GM has contracted with supplier SPX Corp. to offer Chevy Volt customers a 240-volt charging unit priced at $490 before installation. General Motors Co. has contracted with supplier SPX Corp. to offer Chevy Volt customers a 240-volt charging unit priced at $490 before installation. The charging unit, called the “Voltec,” can be ordered now from SPX. Chevrolet also is prepared to offer several other 240-volt charging units -- which have yet to be priced -- from SPX starting this November. 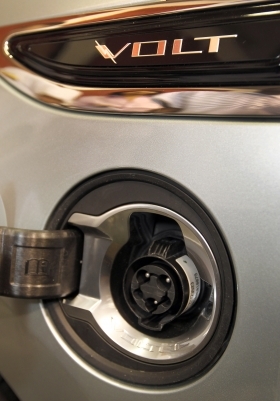 The Voltec is known as a “level 2” charging station, meaning it offers 240-volt AC charging, as opposed to a “level 1” standard three-pronged U.S. domestic socket, or “level 3,” which offers 500-volt DC charging. Customers can opt to charge their vehicles in a home wall socket, but the SPX charging stations offer faster charging and higher voltage. This would allow a Volt battery to go from being depleted to fully charged in four hours with the Voltec compared with 10 hours for a domestic socket. SPX will manage all aspects of installation for Volt owners, including the home survey, installation and permitting. SPX also will identify available programs and incentives for reduced charging rates, Chevrolet said in a statement. The suggested retail price of the Volt is $41,000, including freight charges, and it will be eligible for up to $7,500 in federal tax credits. With installation, the Voltec is priced at an estimated $1,475, depending on electrical requirements. Additional tax credits, varying by state, will be available for customers who purchase at-home charging stations. Chevrolet is set to begin full production of the Volt in Detroit on Nov. 11, and begin limited release of the vehicle in California, Texas, New York, New Jersey, Connecticut, Michigan, and Washington, D.C., in December.